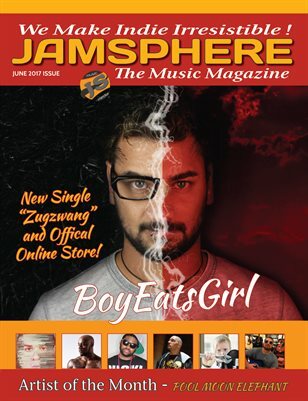 The June 2017 issue of our monthly Indie Music Magazine - FEATURED THIS MONTH - Boy Eats Girl, Dezzyano, Lyrics Of Two, J-Luck, Steady Work, Fr33-Dom, Shutterwax, Reverse Mechanic, The Blue Phoenix, Karma Butler, Grant Maloy Smith, Black Malachite, Recklous, Figure 8, SaFe, DAV!D&CLARA, Danny Baxley, Bigfoot Barefoot, Pool Moon Elephant, Toni Castells - Jamsphere covers all news, reviews, interviews and events of the world's top independent music artists from all genres. Every month we choose the cream of the crop for our magazine, ready for digital download or to be delivered as a physical printed copy right to your door. Copies are also distributed to industry professionals and music's top tastemakers, as we continue our quest to make indie irresistible!